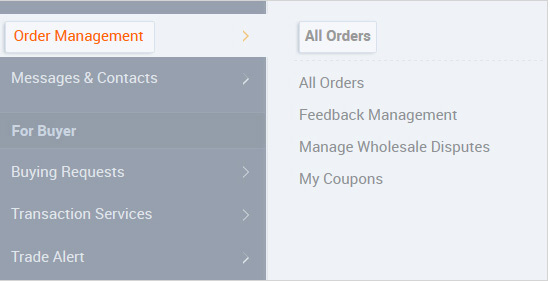 After completing your order, you can leave feedback about the order and the supplier. If you encounter any problem during the order process, you can also submit a dispute. Once your Trade Assurance order is complete, you can leave feedback (for up to 60 days). If/when your supplier replies to the feedback, you have 30 days to revise it if you like. Please note that you only have one opportunity to revise your feedback. 1. Go to the All Orders section in My Alibaba. 2. Choose the completed order(s) that you want to leave feedback for. 5. Submit your feedback by clicking "Submit". Once your Secure Payment order is complete, you can leave feedback (for up to 30 days). If/when your supplier replies to the feedback, you have 90 days to revise it if you like. 4. Rate the supplier in three areas: Product as Agreed, Communication and Shipping Time. 1. Go to the Feedback Management section in My Alibaba. 2. Check or modify your feedback. 2. If your order has not been paid for yet, you can cancel it online by clicking "Cancel Order". If you have paid for your order and the payment has been received, please click "Open a dispute". If your order is complete, please click "Open a dispute". Please note that you can't open a dispute after your order is complete. 1. Sign in to the Complaint Center with your Alibaba account (the one you used to contact the supplier). 3. Fill out the complaint form and click "Submit". Our team will review your case and contact you by phone or email. Under normal circumstances, you will receive a reply from the team within 5 calendar days after submitting the dispute. 1. Sign in to Alibaba Complaint Center. 2. Click on "Complaints I Submitted" under "Manage Complaints".